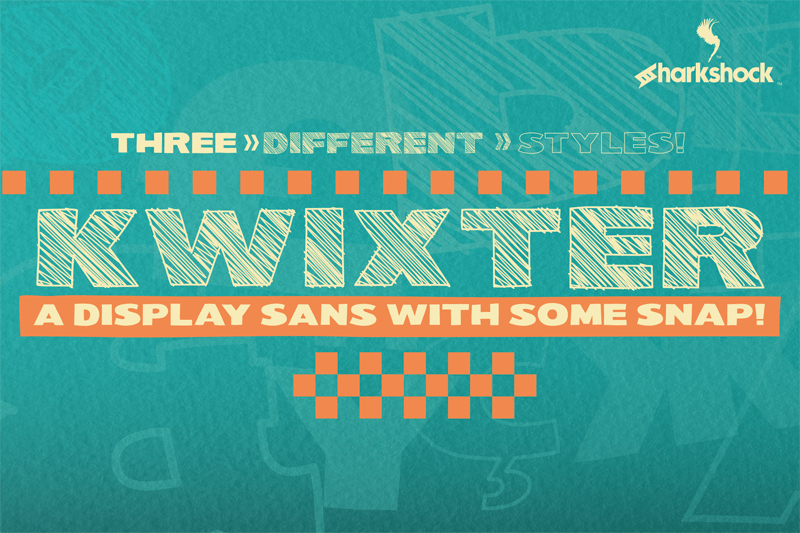 Kwixter is a rugged, all caps, display sans that doesn�t take itself too seriously! The 3 different versions include Regular, Outlines, and Sketch. This broad, yet childlike font was designed to take up horizontal space and inject a little playfulness into your project. The binary nature of this family means it will find many helpful uses in your type collection over the years. It�s structured enough for commanding web headers yet cartoony enough to end up on a kid�s book. Use Kwixter for a company logo or the Sketch version for toy packaging/merchandising. Basic Latin, Extended Latin, punctuation, Cyrillic, Serbian support, and kerning are included in the full version. Please check the glyph map for all supported characters. The demo contains basic Latin, Cyrillic, and limited punctuation. The complete family with all 3 versions is available at $45 for personal use only. This does NOT constitute a commercial license. For commercial licensing please visit www.sharkshock.net/license or send us an email. Commercial usage without a license is strictly prohibited and a violation of our terms and conditions as well as International copyright law. Visit www.sharkshock.net and take a bite out of boring design!